What is a Portable Flue Gas Analyser? 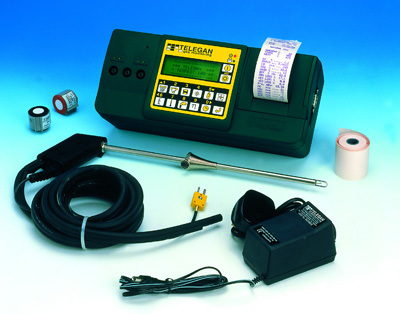 A portable electronic device, a flue gas analyser measures and displays the products of combustion from both domestic and commericial fossil fuelled appliances. Additionally, they can measure the ambient air quality in rooms or buildings. If you are a domestic or commercial service engineer, responsible for installation, management and maintenance, you should always use a flue gas analyser. This article briefly explains the purpose of analysers, what they can be used to do and also the understanding of the information they display. Please remember that this is not a substitute for regulations applying currently or a substitute for regular servicing of appliances. A Flue gas analyser measures flue gases - You place its' probe in the chimney or appliance exhaust and see what levels of Oxygen (O2), Carbon Monoxide (CO), Carbon Dioxide (CO2) and flue gas temperatures are present. They are no more complicated to operate than a video camera and perform a similar function as they are your "eyes" inside the appliance. Some analysers offer additional information such as boiler efficiency, data logging, differential pressure and other gas measurements. They should also offer the option to either print or store the measurements for later review. A Flue gas analyser also measures room air, provided it has been switched on or "calibrated" in fresh, outdoor air. This is invaluable, for example, when trying to find out whether there is CO leaking from an appliance or pinpointing why a CO alarm is being triggered. Appliances such as boilers, heaters, fires and cookers are like vehicle engines, mixing air and fuel and creating products of combustion. If these products, such as Carbon Monoxide "the Silent Killer", are not safely removed they can kill or injure people. Using a flue gas analyser lets you check this is happening both safely and efficiently. This is important because Carbon Monoxide, a colourless, odourless and tasteless gas, is responsible for killing over 50 people a year, mainly from poorly installed or serviced appliances. Flue gas analysers usually display a CO/CO2 ratio. This shows the ratio of carbon monoxide and carbon dioxide in the exit flue (chimney) of the appliance. Generally when this level is below 0.004 the boiler is considered to be running efficiently. When between 0.004 and 0.008 this indicates a potential problem and investigation and retesting must take place. When above 0.008 the appliance must be fully investigated, cleaned and retested. Please note that this is not applicable to all boiler and heater types, especially those using oil or solid fuel. However, if the CO level in the flue of a gas appliance is above 100ppm (parts per million) then an investigation must take place. For oil or coal fired appliances the CO should not be above 200ppm. Equally, Oxygen (O2) levels should be in the region of 3-5% for gas appliances and 5 - 8% for oil & solid fuel appliances - Any other levels suggests an inefficient use of energy,wasting fuel and money, or a potentially unsafe situation where too much CO is created through oxygen deficiency. Flue Temperatures for gas appliances should be less than 200 degrees centigrade or less than 300 degrees centigrade for oil and solid fuel appliances. If CO level at approx 300 mm (12") in front of the flame or grate are above 9 ppm then there is most likely a problem requiring investigation. You should always use common sense when determining whether there is a problem and always consult the national regulations that apply when performing appliance installation and service. 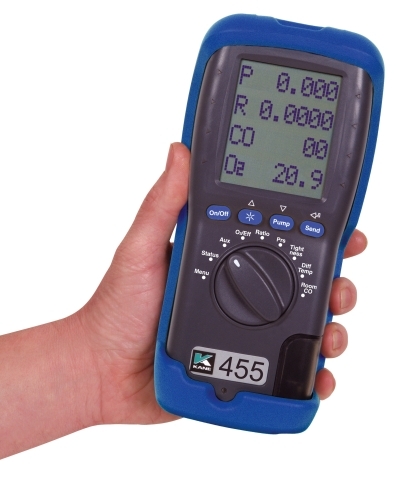 Your analyser will monitor ambient levels of CO in any room. This is carried out by first switching the analyser on in fresh, outdoor air to set its' zero value, following the manufacturer's instructions. You should then take the analyser into the room to be monitored. If the analyser measures CO levels above 9 ppm, an investigation should be made. Any reading over 35ppm should prompt immediate action such as opening all windows and doors, switching off and isolating any appliances present and leaving the room. A subsequent room retest should be made after each appliance has been checked. Don't forget that CO levels in rooms can occur from being adjacent to a busy road, car park or garage, as well as from smokers, outdoor barbeques, adjacent properties sharing the same flue systems, etc. You should always use common sense when determining whether there is a problem and always consult the national regulations that apply to you when performing appliance installation and service. Finally, whilst every effort is made to ensure accuracy, this document is always subject to revision as more information becomes available on CO sources and levels and appropriate testing methods. Consequently we cannot be held liable for any of the information given above.